We are just running 4 months short of the night mare of filling our slip of tax savings. These 3 months are the key months for an agent as well as for an investor to play both sides of the game. In the next following lines I will explain how both the sides of the games are being played. We have got bored with hearing the word of miss selling But when it happens we found our selves in the mid of an ocean scouting for an island. Agents take the advantage of the last minute preparation habit of investors and en-cash the opportunities of miss selling financial tax saving products. All we need to do is to bring some changes in our habits and do the tax planning for the financial year 2009-10 in advance. Moreover before one decides for tax saving one should look into the all the list of probable deductions under which one gets benefits of tax saving. As for my readers I am once again giving the list of all the deductions available under section 80/c. • Tuition Fees including admission fees or college fees paid for Full-time education of any two children of the assessee (Any Development fees or donation or payment of similar nature shall not be eligible for deduction). • Infrastructure Bonds issued by Institutions/ Banks such as IDBI, ICICI, REC, PFC etc. • Interest accrued in respect of NSC VIII issue. This section allows a deduction of up to Rs. 10,000 to an individual in respect of contribution to ‘Pension’ scheme of LIC of India or any other Insurance Co.
Tax saving Pension plans available in market are LIC’s Jeevan Suraksha, ICICI Pru Life Time Pension, Bajaj Allianz, Aviva Life Pension Plus, Max Easy Life policy, Tata AIG’s Nirvana Plus etc. Under This section, a deduction up to Rs 10,000 (Rs 15,000 in case of senior citizens) is allowed in respect of premium paid by cheque towards health insurance policy, like “Mediclaim”. Such premium can be paid towards health insurance of spouse, dependent parents as well as dependent children. Under this section, Interest on borrowed capital for the purpose of house purchase or construction is deductible from taxable income up to Rs.1,50,000 with some conditions to be fulfilled. Often in our busy and hectic schedule we forget that some times we are fully secured in doing investments under the various avenues under section 80c. This is one prime area where agents take the advantage of unawareness and last time preparation. • I request all my readers to calculate that is the limit of Rs.1lakh is filled or not. 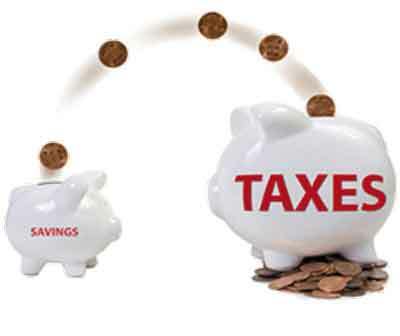 If you have done tax saving to the tune of Rs.1lakh then one should not go for additional tax saving. • Since the major reason is that all your tax saving investments will have a minimum lock in period of 3years. • So rather than investing additional in 80c beyond the limit it would be wise and prudent to go for investment in some other financial product other than 80c. • In the market we find mainly two type of tax saving schemes sold like hot cake. So before you give a call to your I Advisor who will sell his product to you make a calculation of the specified conditions. I will discuss about them in my 2nd series of Tax Saving.